What follows is a lengthy report, which, honestly, I would have made shorter if I could have figured out how. 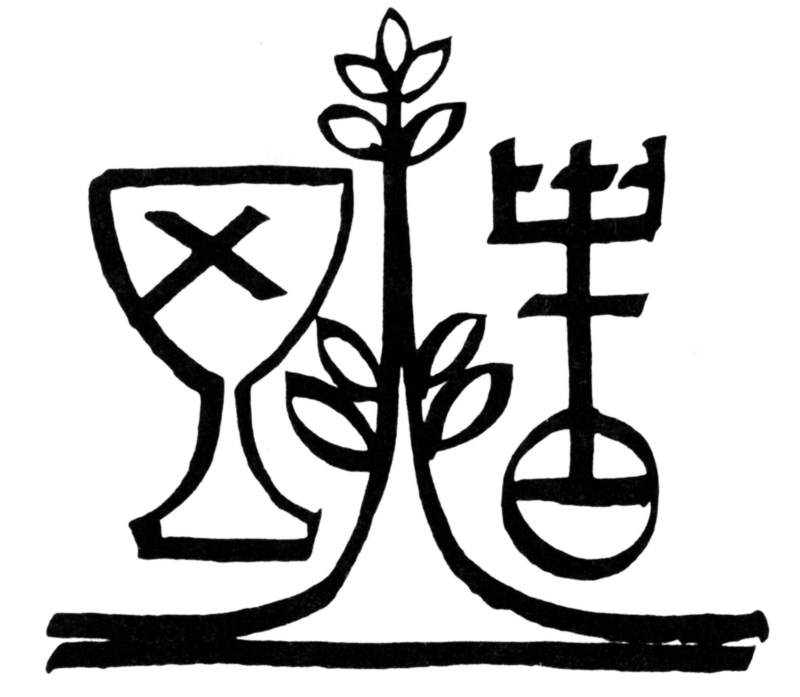 Both the Christian Church (Disciples of Christ) and the United Church of Christ (which are commonly abbreviated as DOC and UCC respectively) are covenantally based; each congregation has autonomy to govern their own affairs and all the congregations live in covenant with the other congregations and expressions of the denominations. In the DOC, congregations are grouped geographically into Regions (we’re part of the Christian Church in Northern California-Nevada). In the UCC, congregations are grouped geographically into Associations (we’re part of the Bay Association) and the Associations are grouped geographically into Conferences (we’re part of the Northern California-Nevada Conference). Both denominations have denomination-wide ministries. In the DOC there are the National Benevolent Association (that’s right, the NBA), Disciples Home Mission, the Council for Christian Unity, and the Division of Oversea Ministries/Global Ministries (to name just four of the at least fifteen General Ministries of the denomination. In the UCC there are Local Church Ministries, Justice and Witness Ministries, and Wider Church Ministries/Global Ministries (to name just three of the six National Settings of the denomination). We are a part of the regional and general ministries of our denominations both because of our congregation’s covenant to be part of the denominations and because of our financial support of these ministries through our annual budget. I spent the first two weeks of July attending the national/international gatherings of our two denominations. For the UCC, it is a national gathering because our churches are all within the USA. For the DOC, it’s an international gathering because we have congregations in both Canada and the USA. There aren’t very many DOC congregations in Canada so, sadly, much of the language used at the meeting tended to forget about them. These meetings happen every two years on the odd numbered years. The UCC’s gathering is called General Synod and the DOC’s gathering is called General Assembly. Delegates to the UCC’s General Synod are selected by Conferences; I attended General Synod as a “visitor” and got to participate in banquets, worship, and workshops, but I didn’t get a voice or a vote on the resolutions that came before the Synod. Delegates to the DOC’s General Assembly are potentially all the pastors in the DOC plus delegates selected by congregations (typically two per congregation). We could have sent four delegates (me, Pastor Brenda, and two church members), but I was the only person representing the congregation at General Assembly. General Synod was held in Baltimore and happened first. The theme for General Synod was “Make Glad,” based on a verse from Psalm 46. Psalm 46 is a scripture that is very meaningful to me and I will be preaching on it on August 20 when we mark the thirtieth anniversary of my ordination. It seems to me that General Synod focuses primarily on the resolutions they consider. 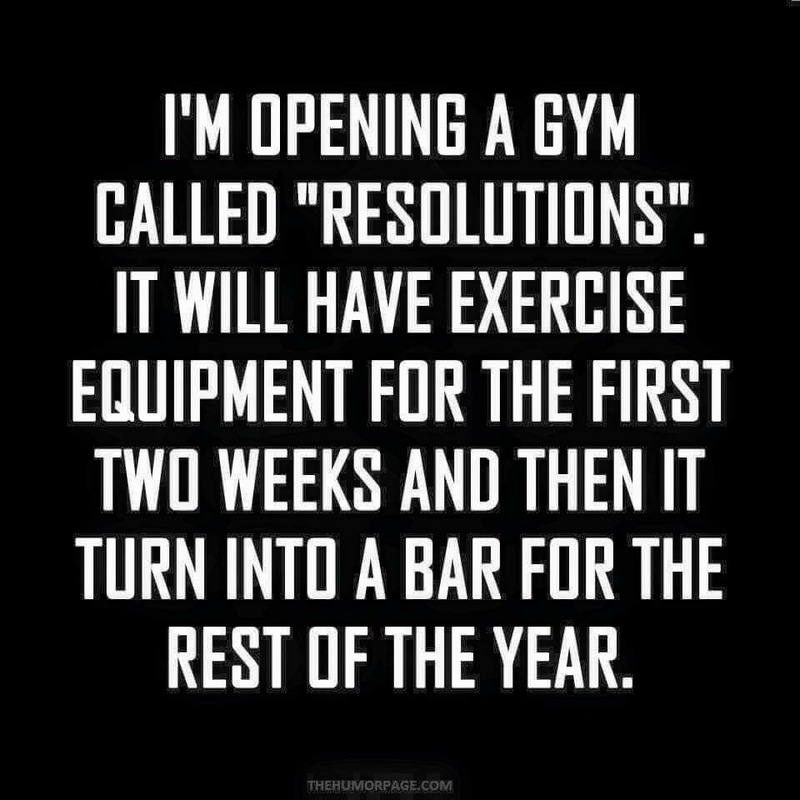 The whole resolution process is very involved. The resolutions typically come from Conferences or ministries in the national settings of the church. Then they are assigned to committees randomly made up of delegates from across the UCC. The committee can modify the resolution, wordsmithing it, hopefully improving it, and (in some cases) combining it with other similar resolutions that come to Synod. Once the committee has modified the resolution, it is presented to the whole Synod, where it is debated, potentially further amended, and voted on. It’s quite an involved process and it means that the schedule is different every day. There are some workshops that are offered. I attended one where the Disciple of Christ minister the Rev. Dr. William Barber, II, spoke. Actually, I’m not sure Dr. Barber knows how to give a speech; he knows how to preach. He also spoke (I mean preached) at a Gala that night. It was one of two amazing sermons I heard at Synod. 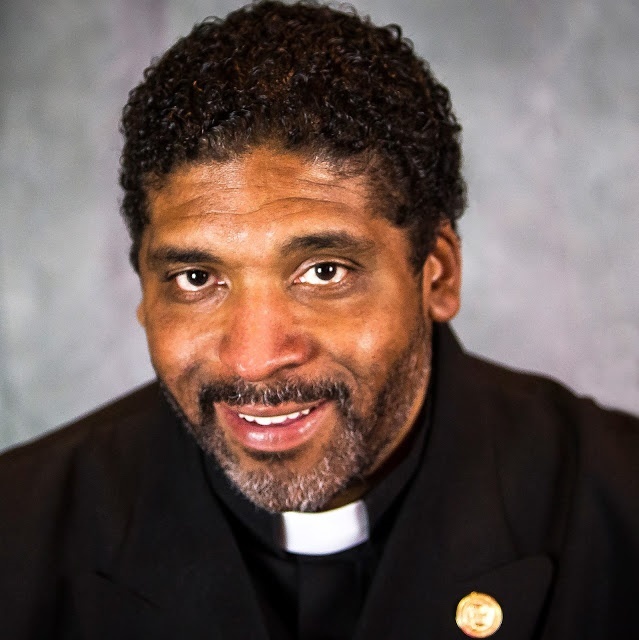 Dr. Barber is helping to organize a new, nationwide Poor People’s Campaign here on the fiftieth anniversary of the original Poor People’s Campaign organized by the Rev. Dr. Martin Luther King, Jr. I will be preaching about this new Poor People’s Campaign in September. Another highlight of Synod was a keynote conversation with Glennon Doyle, an author and the founder of Momastery, an online community where millions of readers meet each week to experience her shameless and laugh-out-loud funny essays about faith, freedom, addiction, recovery, motherhood and serving the marginalized. To be honest, I had low expectations, but Glennon was engaging, witty, and insightful. She has a YouTube channel (https://www.youtube.com/user/glennonmelton) that you might want to check out. General Assembly was held in Indianapolis. The theme for this General Assembly was “One” and the focus scripture was John 17:20-21, a line from the lengthy prayer Jesus prays in the Gospel of John before his arrest and crucifixion. “I ask not only on behalf of these [the disciples], but also on behalf of those who will believe in me through their word, that they may all be one. As you, Father, are in me and I am in you, may they also be in us, so that the world may believe that you have sent me.” Some of you may recognize that the official motto of the UCC comes from these two verses: “That they may all be one.” I was amused that it was the DOC that was focusing on this verse. The really big thing that happened at General Assembly was the election of a new General Minister and President. Sharon Watkins completed two six-year terms so it was time for someone new. We elected Teresa “Terri” Hord Owens as the new GMP. Terri is the first African American woman to take a leadership role like this in an historically mainline church in the USA. She may even be the first African American woman to take leadership of any denomination in the USA. I think her election points to the strides the DOC has made in addressing racism within the denomination and how the General Assembly’s theme, ‘One,’ is being lived out in the church. Assembly has a higher emphasis on education and worship than does Synod (at least that’s my experience) and maybe that’s why there seem to be more visitors at Assembly. Instead of spending so much time on wordsmithing resolutions, the Assembly either says, “Yes, this is the sense of the Assembly” or “No, this isn’t the sense of the Assembly” or “This needs more work before we will vote on it.” This allows the Assembly to talk about the issues rather than the wording, but I still noticed a lack of voices of opposition to issues being discussed. One of the issues we discussed was how to include more voices in the discussions about the issues, both before Assembly within local churches and during Assembly. No decisions were made, but it is something that the DOC is seeking to do. And it is a reminder to me that we need to find creative ways to make sure all voices are heard when the church (in all its settings) seeks to understand God’s will and call. I guess it’s not surprising that similar issues came before both the Synod and the Assembly. Both gatherings adopted resolutions calling both the church and the nation to grow in our welcome of immigrants. Both bodies adopted resolutions condemning Israel for its treatment of Palestinian juveniles arrested in the occupied territories. Both bodies made amendments to their organizing documents (the Constitution and Bylaws in the case of the UCC and the Design in the case of the DOC); the amendments to the UCC’s Constitution still need to be ratified by the Conferences. Both the Synod and the Assembly adopted resolutions on climate change, though their foci were different. The Synod resolution focused on the prophetic role of the church in addressing climate change. In addition to calling on the church to continue learning about and advocating for policies that address climate change, the Assembly resolution calls for members, congregations, and ministries of the denomination to become carbon neutral by 2030 and carbon positive by 2035. This is a bold invitation and I hope we will take it seriously. I think our biggest challenge as a congregation will be figuring out how to make up for the carbon we release by burning natural gas to heat the church. The Assembly adopted the resolution endorsed by our congregation, repudiating the Doctrine of Discovery. I spoke in favor of this resolution, telling the Assembly of your endorsement of it. The UCC had adopted a repudiation a few Synods ago. The Synod adopted a resolution on the economy that calls for a $15 per hour minimum wage. The Synod adopted a resolution that will change the way some of our denominational ministries do fundraising. I am not yet clear on the implications of this resolution for our congregation. It will be interesting to see how it is lived out. Meanwhile, the Assembly received and commended to the congregations a study document on “Stewardship as a Spiritual Discipline,” a document I hope we will engage with in the coming biennium. While I’m always fascinated by the process of writing, (in the case of the UCC) amending, discussing, and voting on resolutions, they are not the only important thing that happens at these events for me. The most important thing for me is the sense of connection attending brings me. I am reminded how we, our congregation and each of us, are part of something bigger. I get to hear stories about what’s happening at other churches, what’s going well and what they’re struggling with. I am reminded that we are not alone. I also treasure the opportunity to hear great preaching. Sometimes this happens at the formal worship services. Sometimes this happens at banquets and rallies. Banquets may be too strong a word. Eating cafeteria scrambled eggs off of plastic plates (yeah, I’ll be complaining about the plastic plates) at 7:00 in the morning is hard to think of as a banquet. Still, it is worth going because you never know what you’ll learn. Two of the best sermons I heard were at breakfast banquets. And even when there isn’t a great preacher, the banquets are interesting. They are sponsored by one or two of the ministries or special interest groups of the denominations and they are one of the best ways to network with people in the denominations who are passionate about those issues and ministries. I got to hear the Rev. 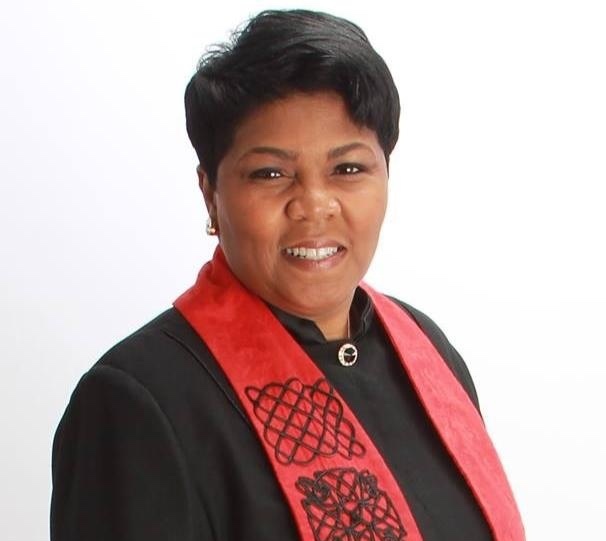 Traci Blackmon (who was elected one of the executive ministers of the UCC at Synod) preach at both gatherings. Her sermon at General Synod was built around an image that I may well use sometime in the future. Her sermon at General Assembly (at a breakfast meeting, really) is making me rethink protesting and nonviolent tactics. And as I mentioned earlier, I got to hear the Rev. Dr. William Barber, II, a few times at the meetings. Every time he spoke about a resolution being considered by the General Assembly (and I think he did three times), the whole assembly knew they had heard the word of God. If you would like to see photos from General Synod, check out bit.ly/2uH94NR. I’m not aware of a central gathering of photos from General Assembly, but if you do a photo search on Facebook for #docweareone or search for that hashtag on Twitter, you’ll find some. on Sunday, January 1, 2017, by the Rev. Jeffrey Spencer. I’ve enjoyed some of the things that have been posted this past week on Facebook about New Year’s resolutions. I’d like to do a quick poll: How many of you make New Year’s resolutions? I don’t tend to. Why set myself up for failure? Begin with the end in mind. In other words, know why you’re making the resolution. This is important advice for any planning. Know your why. In fact, this is such an important point, I want to share a video clip about it. Make SMART resolutions: Specific, Measureable, Attainable, Realistic, and Trackable. Have a plan that is incremental. In other words, know what you need to do today to fulfill your resolution. Celebrate you accomplishments along the way. Limit your number of resolutions. This is needed to keep you focused. If you have too many resolutions, you can end up not knowing where to begin or which resolution should get your attention. Share your resolutions with someone(s) to help build support in your efforts. It seems to me that this advice is as applicable to congregational strategic planning as it is to New Year’s resolutions. And I’d start with the same first piece of advice for congregational planning: know your why. Our congregation’s why, informally stated, is to share God’s love with everyone, no exceptions; to grow in our relationships with God; and to serve you neighbors near and far. As we enter the new year, there are plenty of us in this congregation who are feeling anxious. The causes of the anxiety are varied. Some of us are facing medical concerns, or have family who are, and that leads to anxiety. Some of us are facing job uncertainty or other economic challenges, and that leads to anxiety. Some of us are anxious because of what we have heard from politicians and their supporters over the past year that makes us worried about the future of freedom and equality in our country. While I have a little medical issue that I’m dealing with as we enter the new year, that’s not what is causing my anxiety. My anxiety comes from our national political situation. Based on the rhetoric I’ve heard coming from President-elect Trump during the campaign and since, and based on his Cabinet and advisor nominations, I am worried about what direction President Trump will lead our country. While I am not sure he is sure about what his political vision is, I fear what it could be or what it could become. Mr. Trump’s presidency could very easily be leading toward authoritarian rule. The greatness to which he says he wants to lead America seems to be based on a scapegoating of minorities – racial, religious, immigrant, gender, and sexual orientation and identity. And the path to get there seems to be anti-science and anti-fact. The conclusion I’ve reached is that we cannot protect our nation from this vision with dialogue and fact-checking. It will take action. And I know that when I’m feeling anxious, it is hard for me to act. I hope that we, as a church, will take action this year. Perhaps it will start with making a public witness by adopting a commitment like the one that St. Mark’s Episcopal Cathedral adopted in Seattle recently. This isn’t the time or place to read their statement in its entirety, but I think we need to take similar bold and clear action. We need to proclaim clearly our rejection of White Nationalism, our determination to protect our neighbors from hate speech and attacks, our support of religious liberty, our commitment to end misogyny and sexual violence, and our determination to protect the environment as we work for climate justice. And then, after adopting such a statement, I hope we will fulfill it with our hand and feet and voices. Parker Palmer wrote a column about New Year’s resolutions last year, but when he sat down to write his draft, he mistyped “resolutions.” His left hand didn’t type the first “s.” Instead, it typed a “v”. If we take seriously the vision John of Patmos saw, then instead of New Year’s resolutions, maybe we should make New Year’s revolutions. With the plight of millions of refugees, the continued grief of mass killings, “the persistence of racism and the violence it fosters, the growing number of people living in or on the edge of poverty, the failures of our justice system, the downward spiral of a democracy en route to becoming an oligarchy, [and] the ongoing degradation of Earth itself,” it will take a revolutionary approach to help build the new heaven and new earth that John of Patmos saw was God’s plan for creation. When faced with the principalities and powers of the Roman Empire, John proclaimed that a different way was possible – just as there is a different way for us, regardless of who the current Caesars turn out to be. Palmer’s five revolutions cover much of the same ground as St. Mark’s statement. He calls for a revolution against our fear of “otherness,” and against those who manipulate this fear for their self-serving ends; a revolution against the state of denial in which most white American’s live about white privilege and white supremacy in our lives; a revolution against the nonstop attacks on our K-12 teachers and public education; a revolution against gun-related policies driven by the delusional mentality of policy-makers and power brokers; and a revolution against the fantasy that a few of us can live secure private lives while ignoring our complicity in conditions that put many other in mortal risk. Three years ago, I decided to make some New Year’s resolutions. I had what I thought was a clever approach. I asked myself, what can I do in my life for sake of my environment and for the nourishment of my body, mind, and spirit. One resolution for each of these four parts of my life. For the environment, I resolved to start my laundry in the morning so I could use the line to dry my clothes. For my body, I resolved (with some specificity) shifts to my eating habits. For my mind, I resolved to keep up with reading The Christian Century as the magazine arrived. I did not do so well with these three resolutions. 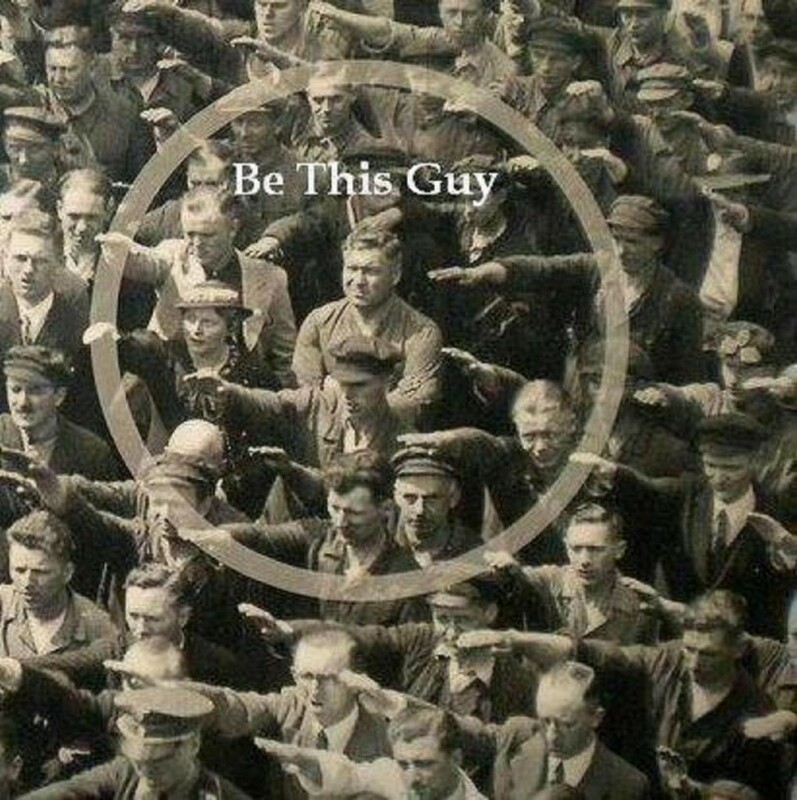 But I am still living with the resolution I made three years ago for my spirit: Be the “be this guy” guy. This is the “be this guy” guy. And here he is in context. Notice what he’s doing with his arms and what everyone else around him is doing with their arms. He is believed to be August Landmesser. Born in 1910, he was a worker at shipyard in Hamburg, Germany, when a naval training vessel, the Horst Wessel was launched and this picture was taken. It was June 13, 1936. Though he had joined the Nazi party, he got into trouble with them because of his relationship with Irma Eckler, a Jewish Woman. Landmesser was later imprisoned, eventually drafted, and was killed in action. Eckler was sent to a concentration camp where she was presumably killed. I’ve decided to make only one resolution for this new year, and it’s really a renewal of that three-year old resolution: Be the “be this guy” guy. I know it’s not a SMART resolution. It’s not Specific, Measureable, or Trackable. It might not even be Attainable or Realistic. But it’s sure seems gospel-grounded and necessary for helping to create the new heaven and earth that John of Patmos saw. So it’s the right resolution – at least for me. I hope you find a resolution that right for you, too. And as we move into our time of quiet reflection, I invite you to think about your resolution for the coming year. Steve Poos-Benson, “Twelve Steps for New Years Resolutions,” Cowboy Jesus, http://stevescowboyjesus.blogspot.com/2016/12/twelve-steps-for-new-years-resolutions.html (posted 28 December 2016; accessed 30 December 2016). Quoted by Diana Butler Bass on her Facebook page https://www.facebook.com/Diana.Butler.Bass/posts/10154446201803500 (posted 28 December 2016; accessed 30 December 2016). On Wednesday, I did something to my back and it’s been hurting since. Daniel José Camacho, “Fascism can’t be stopped by fact-checking,” The Christian Century, https://www.christiancentury.org/blog-post/fascismfactchecking (posted 26 December 2016, accessed 30 December 2016). Stephen Charleston’s post from 29 December 2016, https://www.facebook.com/bishopstevencharleston/posts/1221986484552888 (accessed 30 December 2016). “Renewing Our Covenant: A Statement of Commitment and Action, St. Mark’s Cathedral Parish,” Saint Mark’s Episcopal Cathedral, http://www.saintmarks.org/serve/volunteer/governance/renewing-our-covenant/ (adopted 20 December 2016; accessed 30 December 2016). Parker J. Palmer, “My Five New Year’s Revolutions,” On Being, http://www.onbeing.org/blog/parker-palmer-my-five-new-years-revolutions/8290 (posted 30 December 2015; accessed 30 December 2016). “August Landmesser,” Wikipedia, https://en.wikipedia.org/wiki/August_Landmesser (accessed 30 December 2016).